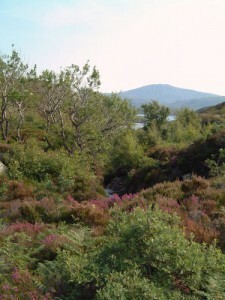 On the southern slopes of Ben More (2034′) is a ravine containing natural woodland and having the status of an area of Special Scientific Interest. At one time this was apparently the usual variety of vegetation for the Outer Hebrides. A disputed theory is that the Vikings devastated it with use and abuse. However, this remaining example, Allt Volagir, is worth a visit and the hostel is well-placed to accommodate after or before a journey to the shores of Loch Eynort.